Makgadikgadi Pan: Makgadikgadi Pan has a fascinating geological history. The area was once part of an ancient lake that dried up some 10,000 years ago. It is composed of many smaller pans with sandy desert in between. The pans are utterly desolate until the rains arrive each year between December and April. The largest single pan is about 5,000 square kilometers/1,930 square miles, and is often covered with water. The area is home to one of Africa’s biggest zebra populations and experiences the largest seasonal zebra migration in Southern Africa in November and again in March or April. In the dry season, which runs May through October, seasonal ponds and channels are devoid of water. During that time, the Boteti River on the edge of the pans becomes a vital water resource for wildlife. Mashatu Game Reserve: In a remote southern corner of Botswana, where the Limpopo and Shashe rivers meet, Mashatu Game Reserve boasts a wilderness terrain of savannas, riverine forests, marshland, open plains and sandstone outcrops. The privately owned land shelters lion, giraffe, eland, cheetah, ostrich and kori bustard. At night, bat-eared fox, African wildcat and leopard prowl for prey. The reserve has recorded some 366 species of birds. In this brilliant setting, one can discover unspoiled landscapes on horseback, mountain bikes and 4 x 4 vehicle, as well as on walking safaris. Mobile Safaris: These journeys travel into a variety of landscapes: the world’s largest inland delta, a seasonal wetland of channels, palm-lined islands and wide grassy floodplains; and massive salt flats that only spring to life when the rains come. Game viewing and safaris are done on foot, by boat and in safari vehicles. They explore remote archaeological sites and fossil beds of extinct giant zebra and hippo. Guides are highly trained and experienced, including the renowned San Bushmen, who share some of their survival techniques in this harsh environment, using the ancient knowledge of plants, animal behavior and skills handed down by their elders. Here travelers have the privileged opportunity to sleep out in the open, surrounded by nature at her very best. Each day’s journey is set to the rhythms of the land and the animals. Moremi Wildlife Reserve: This important reserve encompasses much of the eastern side of the Okavango Delta. Just under 5,000 square kilometers/1,930 square miles, it brings together mopane woodland and acacia forests, floodplains and lagoons. The varied habitats mean excellent wildlife viewing, including buffalo, giraffe, lion, leopard, cheetah, hyena, jackal, impala, red lechwe and African wild dog. Okavango Delta: The Okavango Delta is a jewel in the middle of the Kalahari Desert, an isolated paradise with rich wildlife populations. 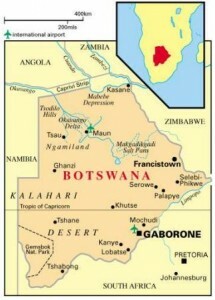 It is fed by the Okavango River, which has no ocean outlet. It forms a fan-shaped wilderness of flood plain, forest and lagoon, with large areas of open water. It is subject to seasonal flooding, starting sometimes as early as May, but generally floods do not reach into many areas of the delta until mid to late June. July and August are the peak flood months. Seasonal water levels mean islands appear and disappear. The delta’s wildlife is as varied as the ecosystems – from tsessebe and reedbuck that thrive in the floodplain to sable and roan antelope found along the streams. Migrating elephant, buffalo, zebra and wildebeest gather around pools of water during the dry season. It is a great area for predator sightings that include a rare, breeding pack of African wild dog and plenty of lion, cheetah, leopard and, now, white rhino. Game activities are land-based, with mokoro excursions from the middle of July to the middle of September for elephant, blue wildebeest, giraffe, Nile crocodile, lion and hyenas well as over 400 species of birds. Luxury tented camps in the delta offer safari experiences not found in most other areas of Africa such as walking safaris and safaris by dugout and boat (water levels permitting), as well as game drives. Selinda Spillway & Savute Channel: The eastern Selinda Spillway links Okavango Delta to the Linyanti and Kwando marshes, rivers and floodplains. The region is one of the least visited and most pristine corners of Botswana, where game viewing is spectacular, particularly in the drier months. Giraffe, baboon, black-backed jackal, elephants, wildebeest, cheetah, crocodile, lion, wild dog, hippo, honey badger, reedbuck, roan, sable and a host of birds populate the region. This remote area is bordered by the Linyanti River, running west to east. On the far bank of the river lies Namibia’s Caprivi Strip, a long, thin finger of wetland in this otherwise arid region. May-August is winter, the dry season with sunny, cool to warm days. Night temperatures can dip below freezing, especially in the southwest. June-October is prime time in the Okavango Delta, with animals migrating to water. March-April is when the zebras and others migrate to Chobe and Savuti. November-March is summer. It’s hot and rainy, but a great time to spot birds and numbers of animals migrating to summer grazing areas. Mosquitoes can be a problem. Calving season is November-December. Although summers are hot, December to April is an ideal time to see the migrating birdlife in the Kalahari Desert. One of South Africa’s foremost cities is the portal to many adventures into Southern Africa. Savute Channel creates an unusual ribbon of grassland, home to a variety of wildlife. This area harbors one of the densest, dry-season concentrations of elephant in Africa. A jewel in the midst of the Kalahari Desert, the delta is Africa’s largest and most stunning oasis with some of the richest wildlife populations in the world. Mazes of waterways, lagoons, vast grassy plains and palm-fringed islands are home to amazing wildlife. The pan is one of the largest salt flats in the world, the result of a vast lake that dried up eons past. This seemingly desolate and little-traveled wilderness comes to vivid life with the rains. This diverse wilderness of savannas, marshland and sandstone outcrops is home to the largest single population (more than 500) of elephants on privately owned land. Mobile tented adventures are ideal for those seeking the most authentic safari experience and for repeat travelers looking for a deeper understanding of Africa. One of the great African game-viewing parks, Moremi is also famous for pioneering walking safaris. This area represents one of the largest concentrations of game left on the African continent. Land price, per person, double occupancy: From US$875 per person per day.